State Street is one of New Haven’s oldest and most important streets. Upper State Street in New Haven, having recently reopened after six years of construction on the bridge over the Mill River, seems poised to change. The City is building a metered parking lot on a vacant parcel at the center of State Street’s I-91 north entrance ramp and also looking at extending on-street parking meters from Downtown up to the I-91 underpass along the entire State Street business district. The former Star Supply Company buildings on State and Mechanic Streets have mostly been demolished and are being replaced with some 270 apartments – one of many recent new residential construction projects in the city. On the east side of the Mill River, the former trolley storage building at 1175 State Street and 470 James Street are on the verge of redevelopment just in time for the opening of the new Mill River trail. 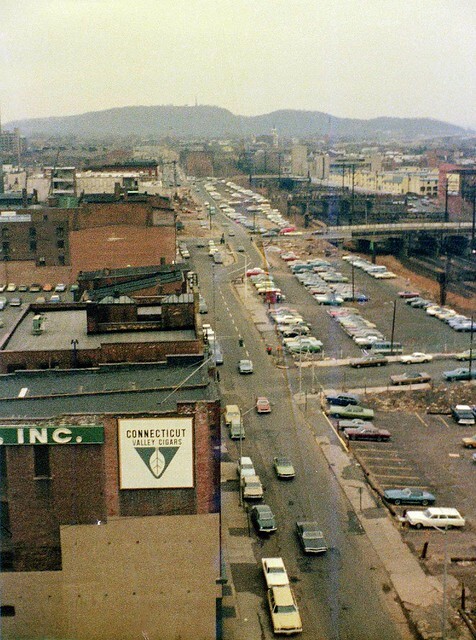 Upper State Street from the New Haven border through Hamden is part of Route 5, the City’s main trucking route to Hartford during the 20th century before the highways were constructed. Today, much of the segment acts as a two-lane roadway with wide travel lanes and shoulders. Sidewalks are adequate but the adjacent land-uses tend to be deteriorating houses and small businesses set back from the street by parking lots. Crossing the border into New Haven, travelers are on the old Neck Road that gave access to Fair Haven and the road to the ferry that crossed the Quinnipiac River in the 18th century. Later, this bridge became part of the Middletown Turnpike. Most recently, the bridge over the Mill River was closed in 2009 for repairs and after several delays finally reopened in August of 2015. Having been closed for six years, it will be interesting to see how this portion of the street reacts, especially with the new parking proposals, development projects, and returning through traffic. Beyond East Street until Grove, this section of State Street was known as Queen Street prior to the City being incorporated in 1784. In East Rock, on-street parking replaces wide shoulders and mixed-use buildings and houses abut the sidewalk at much higher densities than in Hamden. Crossing Grove Street, this section of State Street was New Haven’s Fleet Street. Adjacent to the East Creek in the 18th century, this was Main Street as small ships plied up and down the creek and the harbor. The finest merchant’s houses lined the street until the canal came in 1825, followed later by the railroad and a new wholesale and retail district emerged. The Downtown corridor of State Street changed dramatically during Urban Redevelopment; first, the east side of the street directly adjacent to the railroad was demolished, then the two-lane urban street was transformed into a four-lane divided roadway, and finally parking lots began replacing buildings on State Street’s west side. The recent completion of the 32-story 500 unit apartment building at 360 State, however, may anticipate changes to come. With new housing proposed above Harold’s on Elm Street and developers looking to convert upper floor office space to apartments along the corridor, the fading commercial street may find a new life as a residential district. Union Avenue dates to 1870 when the separate New York, New Haven, and Hartford Railroad companies consolidated and constructed a new railroad station atop former marshes between the Ninth Square and Trowbridge Square – replacing Henry Austin’s train station between State, Chapel, and Union Streets, which later became the city marketplace. Prior to 1870, State Street ended at Custom House Square at the foot of Long Wharf. With the new railroad station, however, State Street was extended first to Carlisle then to Putnam Street, and named Union Avenue as an ode to both Union Street named in 1784 for the newly formed United States and the union of the railroad companies in 1870. Before Redevelopment, Union Avenue was the widest section of the corridor. Today, it carries two lanes in each direction, and on-street parking. To address the issues of speeding and lacking multimodal infrastructure, I propose adding dedicated bike lanes along the entire State Street corridor. In the Hamden section of State Street, which gives access to Universal Drive and North Haven, the generous 40-foot right-of-way would be converted into two 10-foot travel lanes, one 10-foot turn lane, and two 5-foot bike lanes. Over the New Haven border, State Street would take on the character of nearby Orange Street with a 4-foot bike lane between a parking and travel lane on both sides of the street. While wide, the Downtown section of State Street poses a problem on the northbound side of the road. At only 22-feet, the east side of State Street would need to lose one travel lane, but in so doing gains a 5-foot bike lane and parking lane. The southbound, west side of the street has ample room for a 5- or 6-foot bike lane without losing any travel lanes. In the long-term, the goal should be to narrow State Street to allow new construction on the east side of the street between the roadway and railroad tracks. As part of a comprehensive look at traffic patterns in the State and Olive triangle and Wooster Square neighborhood, a report on several options for how to achieve this was released in December of 2016. As a four lane road, Union Avenue is a prime candidate for a conversion to a three lane road with a dedicated left-hand turning lane. This configuration can absorb the existing traffic demand, provide for better turning into parking facilities as well as the train station drop-off, and provide additional space for bike lanes. Furthermore, on the portions of Union Avenue between intersection, a planted median could be added. State Street and Union Avenue, historically important city streets, are on the verge of gaining new prominence in the city as the location of a thriving train station and a new residential construction boom. 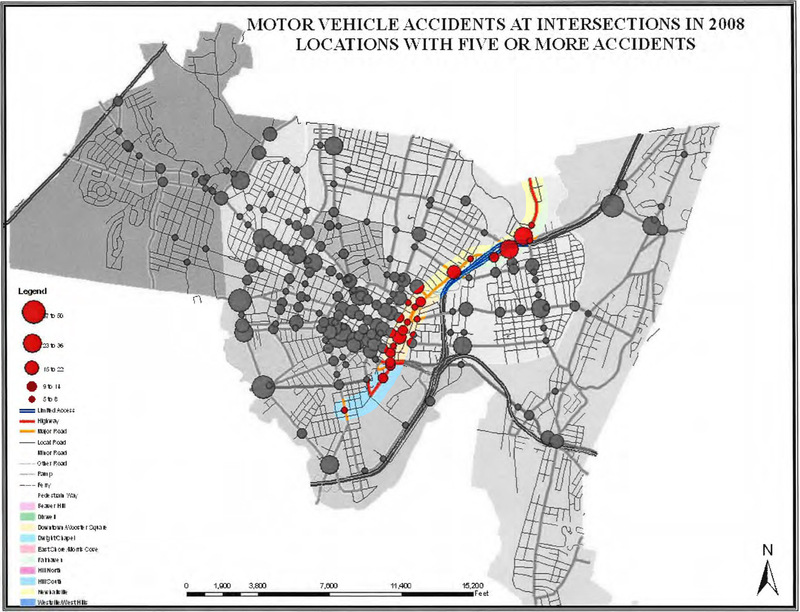 With the street’s current configuration, however, accidents as a result of speeding are frequent and alternate modes of transportation aren’t encouraged along the corridor. Narrowing travel and parking lanes would make room for dedicated biking infrastructure with minimal loss of road carrying capacity for cars Downtown. With dedicated left-hand turn lanes, however, State Street between Grove and George can add a parking lane. On Union Avenue, a four-lane to three-lane conversion would have the same effect with the added benefit of providing a dedicated left-hand turning lane for Union State and adjacent parking facilities. For additional information of four-lane to three-lane conversions see here.